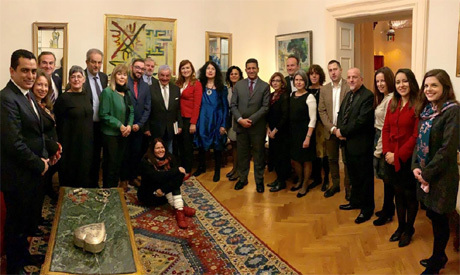 The ambassador of Egypt in Belgrade Amr Aljowaily hosted a working lunch this week for the directors of major Serbian museums and friendship societies with world-renowned Egyptian archaeologist Dr. Zahi Hawass. The event was attended by the deputy speaker of the National Assembly of Serbia and president of the Parliamentary Friendship Group with Egypt Dubravka Filipovski, as well as acting president of the Egyptian-Serbian Friendship Association Aneta Djermanovic. “We expect to make new discoveries during the current Egyptian excavation mission in the ​​Valley of the Kings,” Hawass said at the gathering, expressing his hopes that some results will be reached by the end of this month. Hawass invited the audience to enjoy the safe environment that currently prevails in Egypt and which has contributed to bringing tourism back to its normal rates. Hawass also praised the infatuation of the Serbian people by the Pharaonic civilisation, which he wrote about in the book 'Serbia in Egyptian Eyes' in a chapter titled 'Serbia through Pharaonic Eyes,' which recounts the memories of the former ambassadors of Egypt in Belgrade, and the memoirs of senior intellectuals with Serbia. Ambassador Aljowaily said that the working lunch celebrated a campaign launched by the Embassy this year titled #EgyptALLogy, which aims to promote the ancient Egyptian civilisation through visual arts, theatre, and music. The ambassador revealed that discussions at the gathering included talks with director of the National Museum Bojana Boric Breskovic to explore possibility of creating a pavilion for Egypt antiquities at the museum, as well as cooperation with the Centre for the Restoration of the new Grand Egyptian Museum to restore a funerary mask available in Serbia. “We also discussed with the director of the Ethnographic Museum Tijana Colak-Antic collaborating with the National Museum of Egyptian Civilisation given its unique role in exhibiting the continuity of the Egyptian culture through the various historical eras,” Aljowaily added, noting that there are consultations with the director of the Museum of Contemporary Arts Slobodan Nakaradaon on featuring how artists view the history of ancient Egypt. The Egyptian ambassador also revealed that there are currently discussions with the Cultural Secretariat of the City of Belgrade to organise an exhibition of artefact replicas. Aljowaily added that the gathering was also an opportunity to reach out to professors of archaeology at the University of Belgrade Branislav Andjelkovic and Vera Vasiljevic to translate their publications on ancient Egypt from Serbian to Arabic, in preparation for Egypt's participation as a guest of honour at the Belgrade Book Fair next year.